Customer insights professionals face the challenging task of delivering contextually relevant experiences across the customer life cycle. They need to work with their business technology counterparts to integrate enterprise marketing technologies that manage customer data, provide real-time analytics and insights, and automate cross-channel interactions. 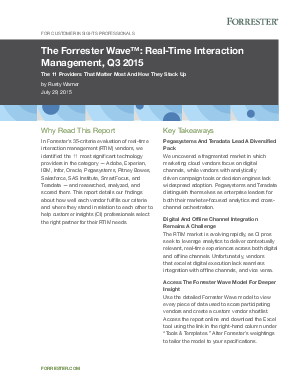 Here is where Real-Time Interaction Management (RTIM) is critical, according to The Forrester Wave™: Real-Time Interaction Management, Q3 2015 report, which identified the 11 most significant technology providers in this space across 35 criteria. Forrester defines RTIM as “Enterprise marketing technology that delivers contextually relevant experiences, value, and utility at the appropriate moment in the customer life cycle via preferred customer touchpoints,” and identifies Pegasystems as one a leader in this very diversified pack. Download this Forrester Wave report to discover how well each vendor fulfills Forrester’s criteria and where they stand in relation to each other to help customer insights (CI) professionals select the right partner for their RTIM needs.